When I was a kid, I read a lot. I still do. I read when I can and I have been known to sit down, lay down, curl up and read a book in a day, or two. Sometimes my reading keeps me from doing something and I get the look, and guilt sets in. Over Thanksgiving break, I came home from school with a book I checked out, Safekeeping by Karen Hesse. I started reading in the LMC (library) when I picked it up, and when I got home, I sat down on the couch and read. I read until I was about to fall asleep. I climbed in bed and read some more. I read a bit the following day and finished reading it as the turkey roasted, Thanksgiving morning. It was a good read. Most of what I read now is related to what I teach, and I teach kids, seventh graders, so I read adolescent literature. Some of it’s good, some not, but it is always interesting. Sometimes I find books for kids that have a similar adult book, almost a match, or similar theme to books written for adults. I truly dislike the term ‘adult book,’ but you know what I mean. As a kid, I read non-fiction and an occasional novel. I read about football, World War II, and occasionally I’d find a good read in a disaster book – fires, shipwrecks, hurricanes, storms, you name it. If there was carnage, I was all over it. Now that I teach kids, I wonder where these kinds of books are, because I can’t find them. I know they’d read them, because that is the type of book an adolescent can sit and read and get lost in, like I did. It is from these books I learned about all sorts of things – like the Andrea Doria, Hazel, Carol, and Carla, too. I learned of the Eastland, Iroquois Theater fire, Our Lady of Angels school, the Cocoanut Grove, and Triangle Shirtwaist Company. Most of the time these memories and facts are locked away in deep memory until something happens like what happened a couple of weeks ago in Bangladesh. They looked back at me in disbelief. I asked the student if I could look at his jacket and I found the label and showed the kids. It read ‘Made in India.’ All of sudden, they began to check their labels and their friend’s labels. A few kids put their arms inside their shirts and twisted them around so they could read their own labels. Only a seventh grader would do this! I heard shouts, as kids blurted out ‘China,’ Vietnam,’ ‘Honduras,’ ‘Costa Rica,’ and many others. Class calmed down a bit and I got their attention. I told them I wanted them to write down where everything they were wearing the next day was made. That was their homework. The next morning, I passed out post-it notes to the class and told them to write the name of the country where each item of clothing came from that they were wearing. A few forgotten and one said he didn’t know where his socks came from and I told him I didn’t know either, as my sock’s label had worn off. And, we both laughed. 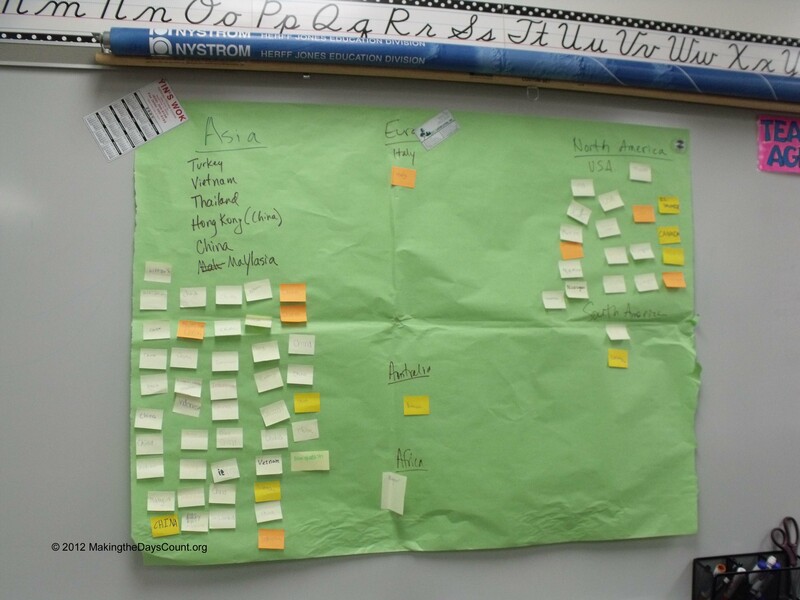 I had chart paper on the board with the continents labeled, all except for Antarctica. As expected, a student corrected me and reminded me I had forgotten it. I just smiled and replied. “I know.” And, I moved on. I asked them to place their post it notes under the continent label. For some it was easy, but for most kids, it was the first time they had thought about or heard of these countries. Most didn’t know where their countries were, much less which continent they were on and I re-directed and asked them to look for their country on a world map. It took a few minutes but we got our labels posted and we reviewed our chart. “A lot of our clothing came from Asia.” A student volunteered. “And North America.” One student interjected. “Hardly any came from Europe, Africa, or Australia.” Several students reported. I asked, “Why?” I got blank looks. A few students agreed. And then a student made the connection to jobs and explained to the class that factory jobs were manufacturing and a secondary economic activity was turning raw materials into finished goods. That was when the kids began to process the information and what it meant. And, I explained and showed a video. It was from CBS Sunday Morning show from March 2011 for the 100-year anniversary of the tragic fire in New York. They watched in silence. Afterwards, there were questions, lots of questions. “The fire sounds like the story in Bangladesh.” Another student offered. 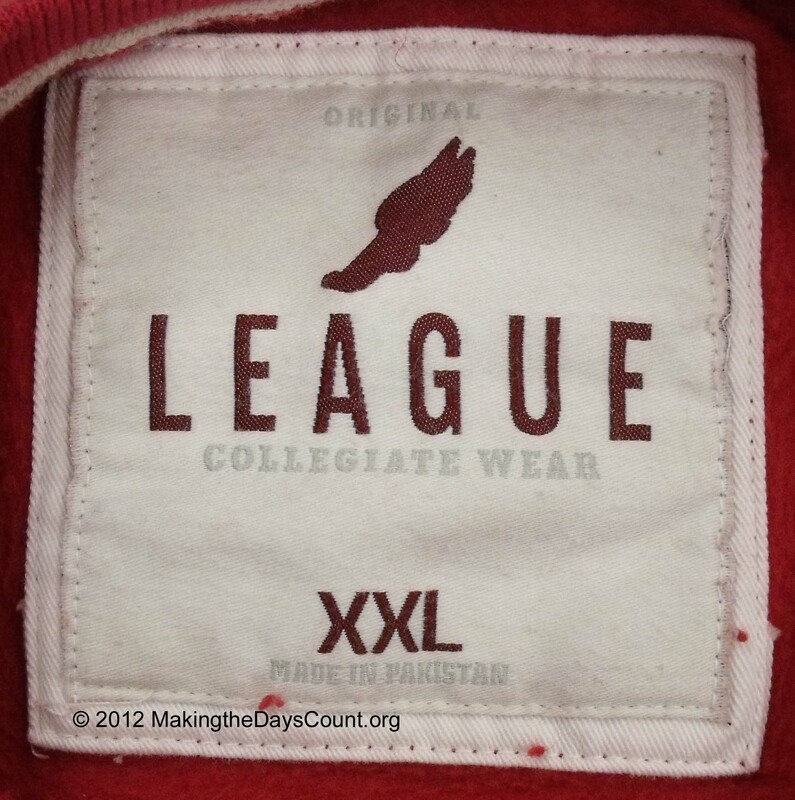 “Some of our clothes were made in Bangladesh!” One student observed. The others in the group agreed and that singular thought seemed to be the theme across the room. I reminded them of the importance of history and knowing what people before us had done, to learn from the mistakes of others, to move forward to make things better. After the Triangle Shirtwaist Fire, laws were enacted to make workplaces safer. It got us on the topic of government and its larger purpose. After every tragedy, some good comes forth. I hope so. Class ended and I reminded them of their homework – it was to ask their parents if their workplaces had fire drills. Though, they didn’t know it – all of class had been carefully orchestrated and thought through – to make them think beyond themselves and look at something they take for granted, things and events that they don’t see. That’s my job, my crusade in class. That was last week, and it is time to think in the present. Today. It’s gonna be a great day. I know it, so I’d better jump up, jump in and seize the day. Because it’s gonna be a great day. Making the Days Count, one day at a time, one lesson, one memory. What is on your clothing tag? I have to agree with marydpierce. From what I understand, teachers like you are rare. In fact, people like you are rare. I had a few teachers when I was in school who stood out for taking an extra interest in me or their work. I ill never forget them and you fall into that category. Your students will never forget you, or that lesson they learned that day. Don’t ever doubt that you have made a difference! thanks, I sense the kids really get my cross between story teller and exploration leader… it suits my style, well. I learn from stories and find it easier to realte content and theme. I remmeber lessons from my education for the very same reason. have a great day! Wow, Clay. Just wow. Your students don’t know it, but they are fortunate to have you in their lives right now. I love how you worked this lesson, love what an impact it had on those kids. Bravo! thanks, it was a good lesson. I think the kids had fun and thought about something beyond themselves – for a moment. On the flipside, that same day, I got an e-mail froma a parent who’s taking their kid to Tanzania over break and is going to miss the last two days. WOW!